By Britten Gerrard, for MSBLNational.comPlaying against two former Major Leaguers didn’t stop the LA Athletics from winning their second consecutive MSBL Desert Classic 55+ wood bat championship title. In a rematch of the 2012 final, the Athletics defeated the Dodgertown West Dodgers 9-5 behind a third-inning offensive surge where they put up seven runs on Martin Luther King Day in Palm Springs, California. 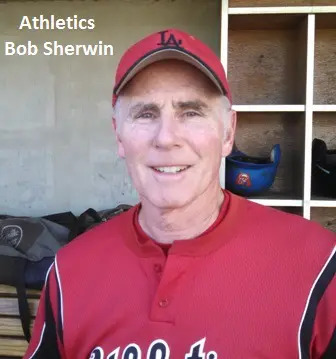 “It feels great because we have a really good group of guys and came out firing,” Athletics manager Bob Sherwin said. They had their work cut out for them because an ex-major league pitcher, Brian Kingman, a major leaguer from 1979-1982, was on the mound. Another Dodgertown player, Dave Cripe, also got a whiff of Major League Baseball air when he played a few games for the Royals in 1980. After the A’s Dave Peyman scored the opening run in the second inning, Mike Thatcher led off the third with a single and the hits just kept coming as Thatcher, Mark Sain, Peyman, Jack Charles, Dan Little, Dave Howard and Steve Barnhart all scored to put the A’s up 8-0. Jeff Wells and Dan Pawelek combined to throw a strong outing as Wells picked up the victory, allowing nine hits and three runs in five and two-thirds innings. Pawelek, who threw a no-hitter in last year’s championship game against Dodgertown, and who earned a victory in the semifinal earlier in the day, struck out six batters in three and two-thirds innings of relief. “He was a beast and dominated in relief after throwing eight innings in the morning,” Sherwin said. After the Dodgers scored a run in the fourth inning, the Athletics added one of their own in the sixth to make it 9-1. Dodgertown West rallied in the sixth and seventh innings to make it 9-5, but Pawelek slammed the door on that rally and sealed the championship. Jon Scheuerman had three hits and was 8-for-15 during tourney for a .533 average. Mike Thatcher dumped three hits into the final game. Dave Peyman and Dan Little had two hits apiece and Steve Barnhart scored twice. Sherwin’s Athletics have played in the Desert Classic nine times, appeared in the finals seven times, and won the crown five times. Dodgertown West, 55+ Desert Classic runner-up 2013–Top row (L-R): Brian Kingman, Julian Lopez, Jack Sills, Dan Steinberg, Rick Fahrney, Rick Rubin and Dave Cripe. Middle row (L-R): Lewis Cohen, John Riley, Albert Ulibarri and Larry Valenzuela. Bottom row (L-R): Brad Seto, Jay Brillantes, Marc Axelrod, Mark Schneidermann, Tom Ebert, Dan Roman and Armando Valle.